A collaboration with makers from the Centre for Appropriate Technology. Anerle-aneme means ‘sit a little while’ in the local Arrernte language of central Australia. The chair is a collaboration with the Centre for Appropriate Technology's (CAT) Enterprise Workshop. Through the workshop CAT delivers training and provides experience to Aboriginal makers. 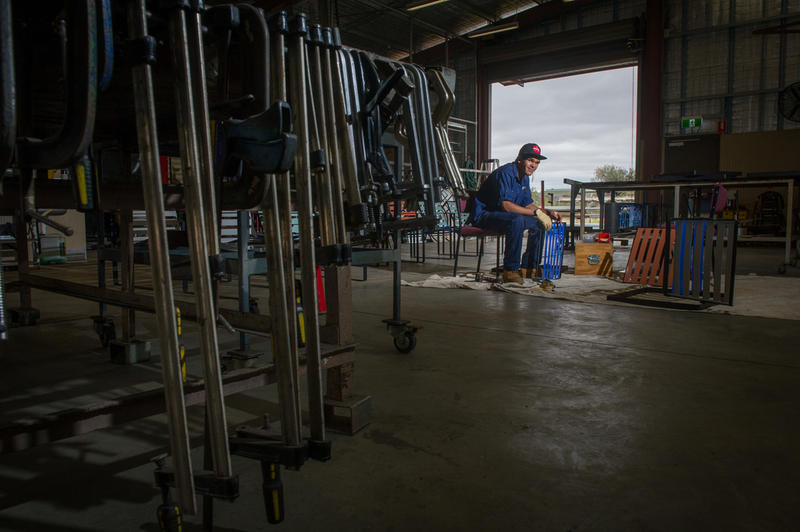 The majority of their work is infrastructure orientated products that are installed and used remotely, the Anerle-aneme inverses this import/export direction, giving the makers the opportunity to create finely-resolved furniture for the rest of Australia. ...and the world. The first 16 chairs were commissioned by Aileen Sage Architects for their exhibition The Pool for the 2016 Venice Architecture Biennale. “The Anerle-aneme chair highlights what can be achieved through creative collaboration between Aboriginal and non-Aboriginal Territorians. Our staff have gained skills and confidence and our innovation will be demonstrated to the world” Steve Rogers, CAT CEO. Photograph (bottom right); Julia Stockinger - Anerle-aneme at The Pool, Australian Pavilion, Venice Architecture Biennale. Commissioned by Aileen Sage Architects.